An Engineer's Critique of Global Warming "Science"
I seem to have missed that memo. Wikipedia still mentions CFCs as a cause. The details of polar ozone hole formation differ from that of mid-latitude thinning, but the most important process in both is catalytic destruction of ozone by atomic halogens. The main source of these halogen atoms in the stratosphere is photodissociation of man-made halocarbon refrigerants (CFCs, freons, halons). These compounds are transported into the stratosphere after being emitted at the surface. Both types of ozone depletion were observed to increase as emissions of halo-carbons increased. Is there any credible backing for Mr. Rutan's offhand claim? When I first read the Rutan comments I though he had simply gone nuts in his general skeptical approach to scares (on Skeptics.se we should applaud his skeptical approach unless his evidence is nonsense), but then I uncovered some recent science that might give some grounds for his claim (though not the degree of certainty he expresses). If the measurements are correct we can basically no longer say we understand how ozone holes come into being. His comments are interesting as they suggest we reached consensus on the ozone hole a little quickly and, once the bandwagon was established a lot of poor science was done (which, despite being a believer in the consensus of global warming he also thinks is happening there). More significantly his comments have been widely reported in climate-related blogs and might be read as arguing that CFCs didn't cause the hole. A more careful reading would be that though most experts think they did, we are no longer clear how. Yes, it is indeed. 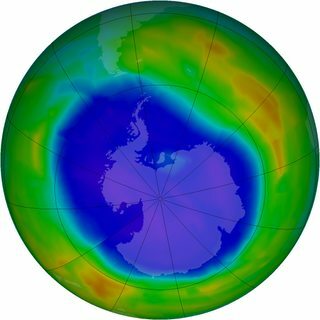 The ozone hole is still there, and will not recover for another 40 years. Meanwhile, CFCs and other ozone depletion substances (ODS) are banned by the Montreal Protocol. The Montreal Protocol on Substances that Deplete the Ozone Layer seeks worldwide phaseout of the production and consumption of ODS. Scientists confirmed that the protocol is working and that the ozone layer is on its way to recovery around the year 2050. The Ozone Hole web site provides reporting on the ozone layer hole, and as you can see, it's still there in 2011. Then, there is the UN-backed "International Day for the Presevation of the Ozone Layer", to keep the attention up. In reality, HCFCs are hundreds of different substances that need to be phased out. We are gradually getting there. alas ... since oxygen-2 is diamagnetic it will be attracted to the poles. the more oxygen-2 up there the larger the area or volume of the oxygen-2. when oxygen-3 breaks down into oxygen-2 the -2 heads to the poles and forces the -3 away from the poles forming a 'hole' for lack of better terms. oxygen-3 (Ozone) breaks down for many reasons. CFCs are just one. but the problem is the chlorine is a catalyst and can cause a geometrically larger increase for contribution than say CME coronal mass ejections. the shift to FCs has helped return the o-2/0-3 to the natural state.